Okay, let’s be honest toddlers are not the easiest to travel with. They don’t want to sit still for an extended period of time. Nor, do they like change in their routine. So, Joe and I decided to put Riley to the test this summer. Not only did we take her away to a strange place on vacation, but we also decided to have her travel in the car for a little over 5 hours in order to get there. Yes, we are brain surgeons. Clearly! Along the way, I learned a couple of things that are necessary to survive. I, unfortunately, learned these the hard way. So I want to help you all out. 1. Try to keep the bed routine consistent. Yep, we failed this one miserably. The week before we left for vacation we moved Riley from her daybed to her big girl bed. When I say big girl bed, I mean a queen size bed that is 3.5 feet off the ground. 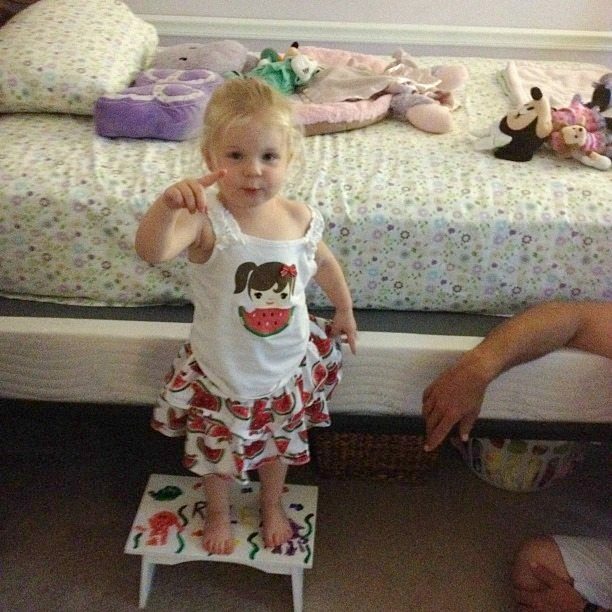 On vacation, Riley slept on the floor on top of her mattress from her pak-n-play. She handled it like a champ, which is to say mommy did a lot of running back up to the room when Riley decided she couldn’t find one of her 37 stuffed animals that she slept with because she had pushed it under the actual bed that mommy and daddy were going to be sleeping. 2. Pack lunch for the car ride to where you are vacationing. I thought she would just eat at a rest stop with us. Why not, right? She goes out to dinner with us and orders. Um, I might want to remember that my daughter doesn’t eat meat and BURGER King doesn’t have a huge selection. 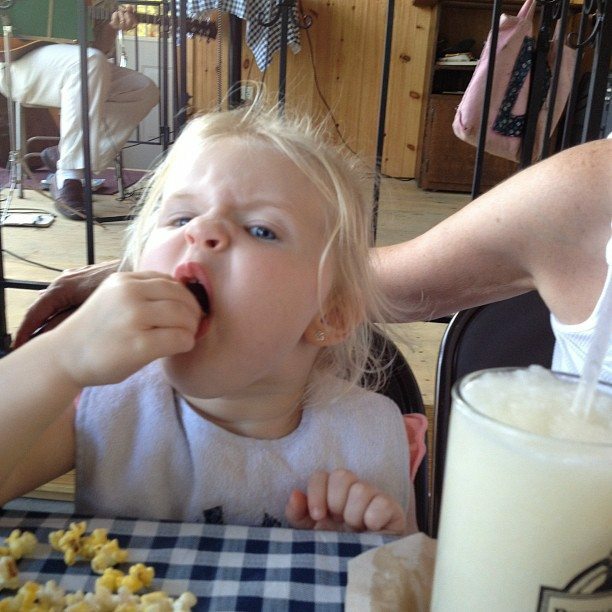 Yes, she ate french fries for lunch, which was after the chocolate donut she had for breakfast. This brings me to my next point. 3. 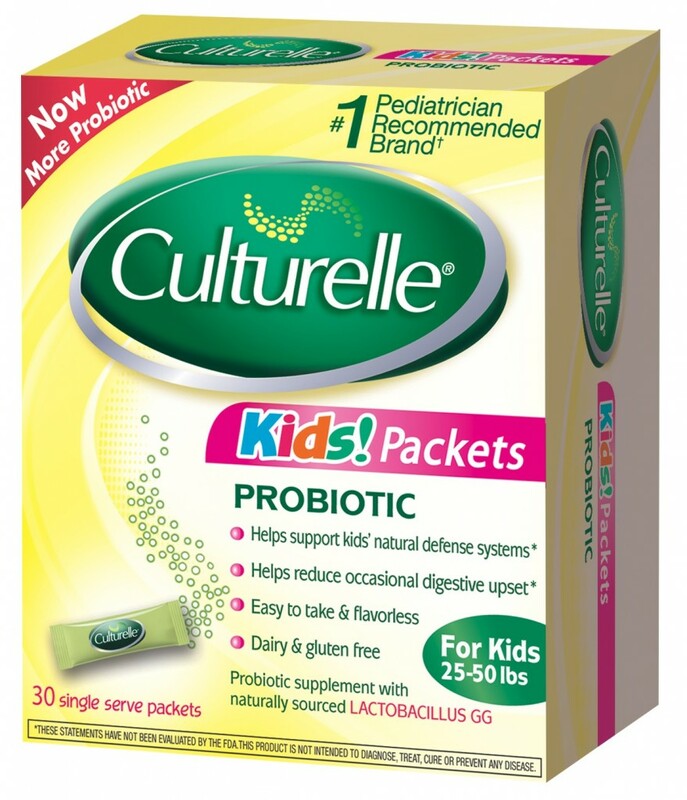 Make sure to bring along Culturelle’s Probiotic Kids Chewables. Especially, if she hates to poop as much as Riley. Riley takes a chewable every day and drinks a glass of prune juice, just to try to keep her digestive tract on course. 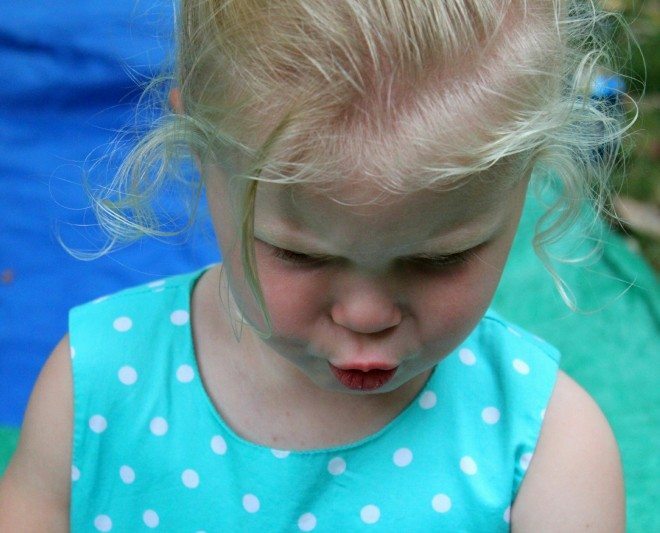 If you manage to forget one day, you’re likely to spend your day running from the slip n slide to the house about 72 times to no avail because as she puts it, “It’s not coming!” So not fun! 4. Talk with your toddler about the automatic flushers in a public restroom before it flushes on her tiny little bottom. The scream of fear that comes out of her because she thinks the potty is sucking her down will break your heart. It crossed my mind to give you a potty shot, but I’d rather be spending time cuddling than consoling her fears. By the way, she still won’t go to the bathroom in a public restroom if it has an automatic flusher. Any suggestions?! 5. Disconnect the phone in the hotel room that you have to stay at when you’re trying to get home and she tells you for about an hour that she’s tired, but won’t fall asleep. The hotel staff does not understand that your two year old is trying to talk to her imaginary friend Emmy. They’re pretty sure that you’ve lost your mind and is likely to call back irate. What are tips that you have? Your little girl is just so sweet!! Hi Jenny. I was talking to my sister last night who just came back from a family vacation on Hilton Head. She has a 14 year old and twin girls (11). She says she needs a vacation from her family vacation. Your tips brought her to mind. Even though her kids are older, I think she could have used some of your tips. Bet you had an awesome time anyways. I think those are good tips for older kids just as much as for younger kids. My 7 year old son has Sensory Processing Disorder and HATES the automatic flush toilets still. We put a piece of toilet paper over the sensor on the toilet. That keeps the sensor from activating while someone is in the stall. Then when my 7 year old is done and out of the stall, I go in and take the toilet paper off the sensor so the toilet can flush. GREAT tips! I have a lot of experience traveling with babies but now that we are potty training a toddler I need all the toddler travel tips I can get. Thanks! Looks like someone else left the tip about the toilets. The piece of toilet paper only works when it is a sensor attached to the toilet (not the ones that are in the wall). I saw that tip about putting the piece of paper over the sensor when watching and episode of Jon & Kate +8….I had one of those moments, like….why on earth did I not ever think of that. When the sensor is in the wall. I stand there with my hand on the sensor and don’t move worth anything(meaning if your Riley is like my girls, get her toilet paper before you cover the sensor). Then when they are done, you can move your hand and it will flush. How funny. I especially loved #3. Love the honesty of traveling and surviving a vacation with a toddler. Did you have to pay extra for Emma to stay in the hotel with you? Love the picture of you and Riley. Looks like some great memories were made. I will be vacationing next week with our very active 17 month old (8 hours worth of flying each way). It should be interesting! So funny! Loved the toilet tip. I’d have never considered that. Thanks for sharing. Love the new header! Is it really safe for a baby to sleep on a pack-n-play mattress? What kind of mattress do you have?